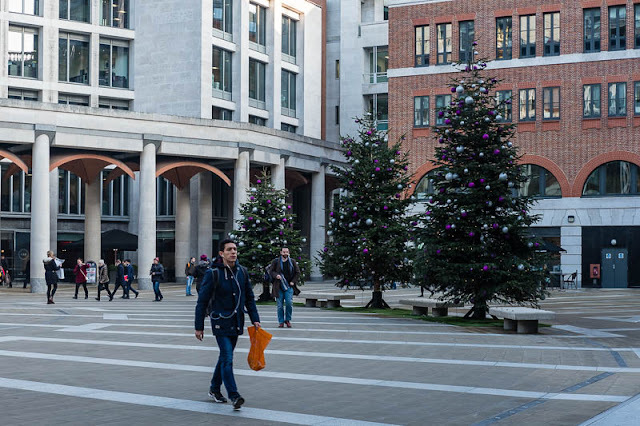 The stylish Xmas trees in Paternoster Square behind St Paul's cathedral. When did the tradition of decorating a tree at Xmas time begin? It was Prince Albert after all. To learn all about the history of Christmas pop over to the wonderful Christmas post by Mike from A Bit About Britain. Lovely looking trees, love the purple baubles. Yes, that post from Mike was a great read wasn't it. Beautifully decorated. This shot really conveys a sense of depth. I know right where that is. When I was there in September, I got interviewed right there by some marketing people about the name of a new hotel coming to London.